An unfortunate consequence of the “age of information” we live in is that people’s attention spans and tolerance for long readings has shortened significantly. Graphic histories such as Abina and the Important Men might be a new trend in the academic world as an answer to this phenomena. Abina and the Important Men is a relatively short graphic history that depicts a brief period of time in 1876, Gold Coast of West Africa (present day southern Ghana). It is non-fictional historical study based on an interpretation of a court case transcript found in the historical archives of the country. The book was written by Trevor Getz, a historian and author and Liz Clarke, a graphic artist and illustrator. There are five parts to the book; in the first part, with the help of graphic illustrations we are taken through the story of how Abina Mansah charged Quamina Eddoo, an important and wealthy man in the Gold Coast, with the crime of having kept her as a slave. At the time the Gold Coast was under the British colony and was subject to British laws, which prohibited slavery. Although Abina was unsuccessful in the end, the story brings to light issues such as the balance between justice and “keeping the peace” and the conception of slavery and rights at the time. The authors did a good job in providing context and illustrating the validity of the story of Abina. The second part of the book provides the actual words written in their primary evidence (the transcript). This allows the reader to make interpretations his/her own and decide if the authors presented a legitimate one. The third part gives a thorough context to the story by providing information about the early history of the Gold Coast, including its inhabitants and various leaders. It familiarises the reader on the practice of slavery both in the Gold Coast and in the broader world at the time and gives further descriptions of the specific people in the story (from what is found in other historical documents and oral histories). Finally in the fourth part, the authors engage in explaining the process through which they came to their interpretation of the text. They do this by providing philosophical, ethical and methodological answers to the questions “Whose story is this? Is it a true story? Is it an authentic story?” in three levels of complexity. Multiple times within the book the authors mention the reason behind their efforts towards this project; they wanted to bring to light a part of history that had been forgotten and ignored by historians and use it to bring more insight towards the lives of the people. The book did just that. It created a way in which the reader could really understand that period in time. It allowed the reader to connect with Abina and understand her struggles in the context of where and when she lived. Unlike most history books that simply state names, dates and events this one encourages the reader to look beyond and explore the real lives of people we study. The fifth part of the book deals specifically with how to utilize the book in a classroom setting. It explores different facets of the story and how it might apply to different studies like Africa, gender and slavery. It even has a list of reading questions designed for students at different levels (high school, college and advanced undergraduate and graduate students). Depending on how deeply and focused (towards a certain topic) one is when reading the book, it can be used to examine a multitude of issues in a historical context. It is, of course based on primary material that covers a very short amount of time and a limited area in history so the text might not be as useful for studies with a broader scope. 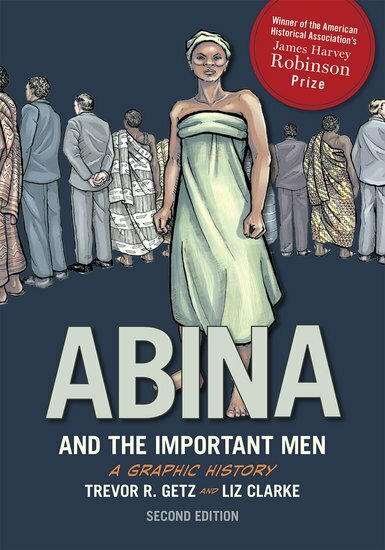 Abina and the Important Men is the first of its kind and shows a promising future for similar texts. It utilizes real historical evidence and comes up with a way to convey history in a more approachable and relatable manner. Its breakdown simplifies the process of understanding history and its ramifications. Thank you, Eleni, for this excellent book review on Abina and the Important Men. It is very interesting how the author of that book split up its 5 parts with its overall theme the unfortunate consequence of the age of information due to the fact humans are experiencing shorter attention spans. The fourth part of the book, as you describe, seems to be very interesting as it highlights more of the philosophical, ethical, and methodological responses. The ethical understandings of our age within a time where we all experience must shorter attention spans in affect of the increasing influence of technological advances of our lives, is that the things in our lives that takes time, such as the gift of patience, is slowly dying within all of us. How can we combat against societies influence of technological advanced that affect ones shorter attention spans? Is there anything we can even do? Thank Eleni, for such an insightful and comprehensive book review. I was especially interested in the authors intentions in making the book and how important such creative endeavors are to increasing representation of diverse cultures and stories to the age of globalization. It’s easy to get lost in the loud and numerous works put out by western nations and not be able to get a glimpse at all the rich and differing cultures that exist/have existed throughout the world. I’m pleased to see creators doing such important work and putting content on the market that exposes readers to a wide array of information. This is a really interesting concept. I appreciate the idea of presenting important information in this format. It sounds both engaging and effective. I like the questions put forth: “Whose story is this? Is it a true story? Is it an authentic story?” and I would argue that we should really be thinking about this at all times when we are reading. I read Maus in high school – a graphic novel about the Holocaust. While some of the graphics were disturbing, I found that the art was very chilling and effective in communicating the narrative and addressing the horrors of the situation. With that, and with your article, I am interested in reading this graphic novel. Thank you for sharing this article! I can agree that even I seem to find the shortest books, articles, etc. to read for times sake. Short reads can loose a lot of information just because of how much is not written down and read. The way that this book seems to be written out, seems to do just the opposite. A short read that is put into a format that can be read from different age/school levels sounds like a fantastic way to write a book. And that it was written as an educational text where there is a section for the reader to analyze the document themselves shows that there is no one way to interpret information sometimes. I feel this way towards many parts of literature. The reader is just as much different as the each context put in front of them. Is there a wrong and right interpretation of readings? If so, who determines the right against the wrong? This book would be something I would read because, as you stated, it can be used for different forms of education and much can be learned from this single read. This article had great meaning to real life education. As a student, I generally look for books and articles that will take up less time to read because I often have more than one class to focus on. I believe that a lot of pieces of history are glossed over and often forgotten because there truly is too much to cover in every history class. But, that does not mean these topics are any less important. I found the set up of the book very interesting and helpful for students. This would be the perfect type of book for a research project due to the fact that it walks you through everything step by step. I really enjoyed the fact that you did a book review for NSR. I think that we could do more of this moving into the future and that it would diversify what we have available for people to see and read. How did you like the concept of the graphic novel? You mentioned that our patience and attention span have decreased in the digital age. I wonder if graphic novels will give people the chance to do more reading while also holding their attention for longer periods of time. Thanks for sharing, Eleni. You are correct in saying that many people have a low tolerance for long readings. But is that really due to the age of information, or rather because we have become such a high-paced society? Almost everything we do is in order to reach an endpoint and reach that endpoint as quickly as possible. Not much time is dedicated to things like nature walks or reading long books because we seem to be too busy with deadlines and other tasks. I suppose the age of information does not help this problem. I think what we have to do is adapt, and the book you read and wrote about is a great example of that. The fact that it is short and has graphics makes it perfect for the fast-paced culture we live in right now. It also appeals to different types of learners with regard to the graphics, history text, and transcript included in the book. It sounds like a great piece of work. Thanks for sharing! I think it is a combination of both the high-pace society and readily available information. I agree that people tend to fill their lives with so much stuff that there is not much time for reading. However, readily available information adds to the problem. This is evident because people tend to read several short books rather than slowly reading a long book. There is so much information available that people know they cannot absorb most of it. Instead of looking for in-depth analysis, people tend toward short summaries and clips. This allows them to know a little bit about many topics and feel like they know more. This book does appeal to today’s society, but I hope to shift my priorities towards longer, in-depth reading. Thank you for your story. In today’s society everything we do seems to be rushed. We are all under a time crunch and the best way to get everything done is to rush through it. Because of this, I find myself spending long hours on Amazon and in the library searching for short, but good books. I have not yet read this story, but it sounds very interesting. Interesting and short enough to keep my attention for longer than thirty minutes. I believe that while generations keep progressing, people are going to want shorter and shorter novels. I mean, looking at all of the books that I own, they are all short descriptions of other books. The important pieces of my history book, for example, were cut out of the previous edition and put into a new text that is shorter and focuses more on those pieces. Will this phenomenon ultimately lead to a void in our storytelling skills because people want fast facts and do not care about the intricate details? Eleni, thank you for sharing this! I would also suggest that another unfortunate consequence of the “age of information” is that people do not have the time or drive to set aside to read long works. I know that although I enjoy reading and possess the attention span required to analyze long works, I am not always in the right state of mind to do so after an exhausting day. What do shorter works lack and take away from the reader, the the intricacies of the content, and the experience? The balance between “peace” and “justice” is extremely complex – many question whether the two are interdependent or should remain separate from one another. I enjoyed at the book contained information about the philosophical ideas the authors intended to address within the work, most authors don’t do that. It can be a great way to encourage critical thinking making a reader consider the philosophy behind the works, but I think it would be interesting to read a work where these thoughts are provoked more directly. How did you feel about the way the philosophical questions were presented? I appreciate this post because it does a good job of advocating for ‘missing’ pieces of history that should never be forgotten, but often are. In a society where everyone has time for a quick skim of a few pages of a book, this type of text may be the new way of writing in the coming decades. I think you did a great job of outlining the five parts of the book, and explaining the objectives that each one had. By giving a us an example of lost history, and the racial ties that it includes, I think more authors may follow by example in trying to create texts that give us more insight into similar historical issues. Thank you for the wonderful book review! First of I think its pretty cool this a book and what you learned your trying to spread the word and inform others. Also thank you for sharing this article with us. In today’s world yes everything is rushed and people are going for quanity and not quality. I think you have a very valuable point and it is tough to find books that have great description and deep meaning. I often feel we will read shorter books but like getting good content. Generations are changing and I think the change is good it keeps people on their heals on what to expect because it would be boring if history was all the same and never changed. I think change is good because otherwise we wouldn’t be learning new things about our past generations which is so interesting to me how we pass history down by story telling it truly does blow my mind. This is good for us to communicate on our past through words in a book or by voice. All in all I don’t think history will ever repeat itself and we will keep learning from our mistakes. Just looking at the name and the image, I imagined the book being about the powerful woman that had to overcome some difficult odds she encountered to be considered one among the important men. But reading your piece goes in accordance to Ellery, who talked about the act of reading slowly, but yours deviates towards shorter books because people do not want to sit for long reading slowly. This is very interesting because I would like to think that I am aware of events happening in the past especially the fact that this happened in Ghana. I have not heard of this until now and I appreciate you writing this now and the fact these people decided this story was important to bring back that way the past if not to be forgotten. The picture is sort of like the story, but she failed in her expedition. I am very interested in finding more about my culture and heritage in terms of the migration of slaves and such to identify a story that has not been told before. This is really great, I love seeing something new on NSR. I had very limited ideas about graphic style novels being sort of “comic-y” for lack of a better term. I love the idea of a graphic history, and especially one that highlights parts of history that were perhaps forgotten. I agree with you and am guilty of leaning toward shorter books for the sake of convenience. Maybe these types of graphic histories will become more prevalent. Thanks for sharing! We certainly live in an age with increasingly shortened attention spans. It is definitely interesting seeing the new innovations to cater to this fact. I am not sure if it is a good or bad thing that we are catering to our decreasing attention spans. Although it may be a bad thing, this new style of novel is cool to see. The novel really breaks up the information and story into easy to understand sections. I would definitely have an easier time understanding the information when it is broken up nicely. I bet more of these styles of novels will become much more prevalent in years to come. Thank you for this great recommendation, I am very interested to read this book myself. It is so fascinating that the majority of history is now in cut-and-dry textbooks with little to no stories and imagination when in reality all history is is one big story. Emphasizing the value of storytelling is something I have been challenged but also very much enjoyed to do over the course of this semester. A powerful woman like Abina obviously had such a complex and interesting story to tell, so it’s great that it was shared in this way. I hope in the future the importance of telling a good story while also sharing vital pieces of history is something that can occur. I love this article. I think this is a great idea to try and shorten a history book and just covering one topic more in depth. This will keep the readers attention, as well as give him a more in depth understanding of the period being discussed. It does however lessen the amount of information one could learn in the span of a semester however. Over-all its a good idea though. In some ways I am very surprised that it took this long for a book like this to come out and be written. Recently in a class of mine we were discussing how in grade school some parts of history was forgotten. Ironically these parts of history are the darkest parts. I enjoyed how you described how the book is written and works. How it can be used for different aspects of that time period and what subjects it touches on. I think that this will be a new start in the way that college students learn from class required books. Thank you for sharing this! I have never heard of a book like that. I do agree with you that our attention span has shortened when it comes to reading longer stories. We have talked in our History class how the textbook has been getting smaller and smaller because they can sell more copies that way. I think the idea of having a graphic novel is really interesting. It reminds me of how we will add color to old black and white photos from the past. It is a way to get a different perspective on some parts of history. Thank you for sharing Eleni. You said that in the growing age of information people’s attention spans are slowly decreasing which then leads to people not wanting to take the time to sit down and read a book so out comes the historical graphic novel. I agree people have become very impatient when it comes to research. They know they can just type it into goggle and get it in 10 seconds instead of reading a book that will take hours. The idea of creating historical graphic novels is actually a really fascinating idea. I don’t know if the increase in people reading will occur right away but I do believe this could lead to a bigger movement especially when it comes to High School students. I really liked that the Authors picked an area of history that is often neglected and decided to create this story to shed more light on what it was like for someone on the Gold Coast during British control. I really like the idea of doing a book review on NSR I think more people should jump in on this idea. Great Article! What a good post and interesting book! When I was reading the part about how we now don’t have a high enough attention span to read long books, it made me really think about the culture we have today and what people are now valuing more. I definitely agree on our attention span shortening. We are wanting new things and getting bored faster. This book sounds really interesting and it seems like it’s a new type of way to educate students in today’s society. Adjusting how we teach will probably be one of the best ways to educate since each generation is changing and the way they think or their interests are shifting more. I really liked how the book had sections that went in dept or ideas and question depending on one’s level. Overall, really interesting!! I have never heard of this and I am interested in finding out more or seeing it in the future. I myself am an avid reader and have noticed how the wonders of reading have been lost to the social media age. I believe this eventually will be the medium for books of the future. There are some things that can not be as concise as many people want, which makes me wonder if those pieces of literature will eventually fall out of normal use. As long as we are talking about the issue I think there will be an easy solution that comes into place. This was a wonderful article on how to use this book in the future. I enjoy how it includes a chapter on how to implement it into the classroom because having a set standard when trying to figure out how to teach the book gives the teacher an overview of what to form their lesson around. You also touched on the chapter that had the interpretation of the text which was very interesting that a book includes that as well as the lesson plan help. I wish that more books had this backstory and support so that more teachers would teach beautiful pieces of literature when they might not know where to start. This text sounds like quite the interesting read and I can think of multiple ways of putting this into the classroom. I think it is so important to change our teaching with this new age of technology that is ushering itself into the classroom.